Spill Containment Products are a secondary line of defense used for any location handling the storage of hazardous material such as fuel, oil, and hydrocarbons. Made from a combination of flexible and rigid fabrics, these products have been successfully implemented under vehicles, tanks, drums and other machinery to contain hazardous materials in the event of a leak or spill. Available products include spill berms, frame tanks, mini basins and self-rising onion tanks. 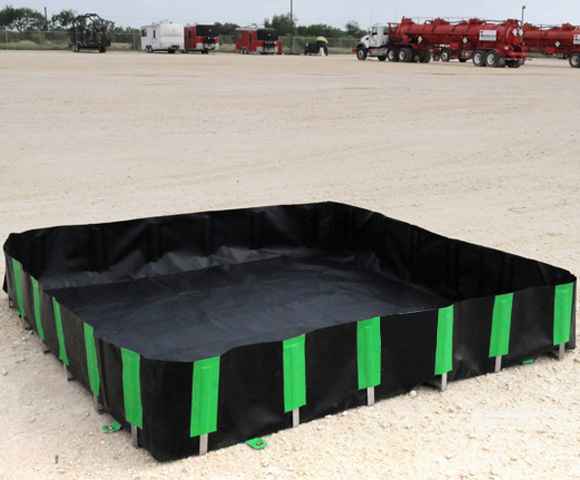 Spill Berms are one of the most flexible options for containing and storing large and small products including tankers, tanks, vehicles, machinery, and valves. Made from a high resistance, light weight fabric, these berms offer easy mobility, fast set up and compact storage when not in use. One of the biggest advantages of spill berms is their ability to allow vehicles and other equipment to drive directly into the containment area. This allows the berms to be accessed as needed to contain forklifts, drums, and other moving vehicles. 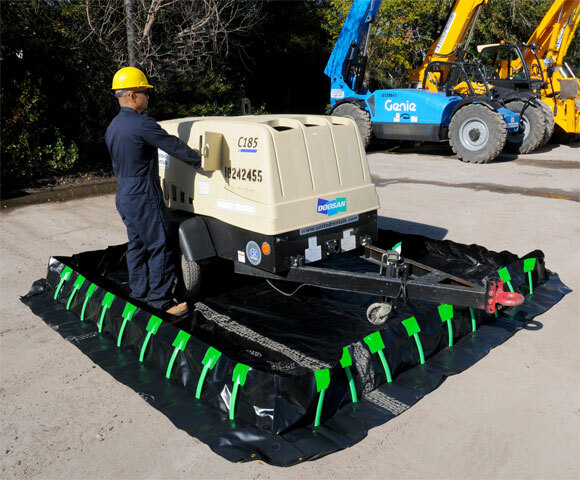 Similar to berms, containment tanks are designed with light weight materials for emergency response to industrial leaks and spills on your site. Learn more about styles and types of containment tanks. 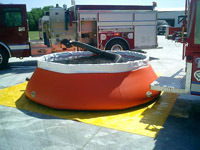 Other containment tanks, such as the self-rising onion tank, are ideal for emergency response as they contain a self-rising design that allows them to adjust as liquids fill the tank. 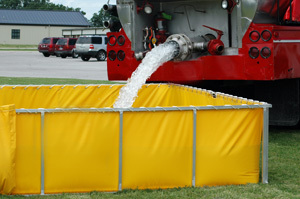 For smaller spill containment requirements, a favorite is an item known as the Spill Basin. This mini, flexible containment bas in features walls that will snap into place to form your needed containment area. When is Secondary Containment Needed? 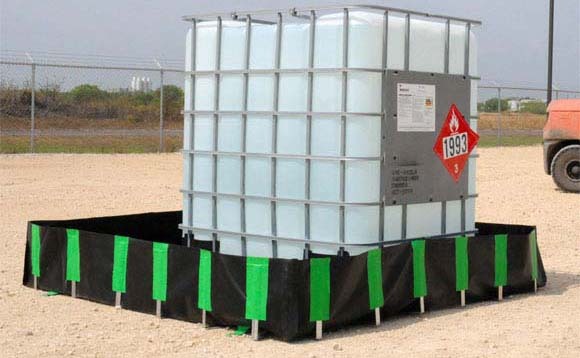 Secondary containment is typically needed in any location storing a hazardous or potentially harmful liquid, including but not limited to, fuel, hydrocarbons, oil, and chemicals. EPA regulations state that your secondary containment product should be able to contain 100% of your largest container or 10% of the total volume of all containers, whichever is greater. Additional regulations may be required depending your location. Contact your local DEP or check out additional information on EPA and SPCC storage containment requirements. We also offer other spill control products such as double wall storage tanks, spill pallets, drum storage, and 100,150,200,385 Gallon Oil-Tainer tanks. 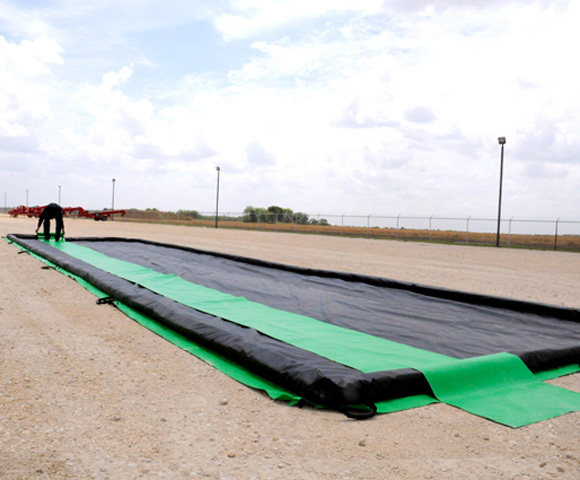 Berms have also been used for containment under our large collapsible tanks, such as those used for Fuel Farms.